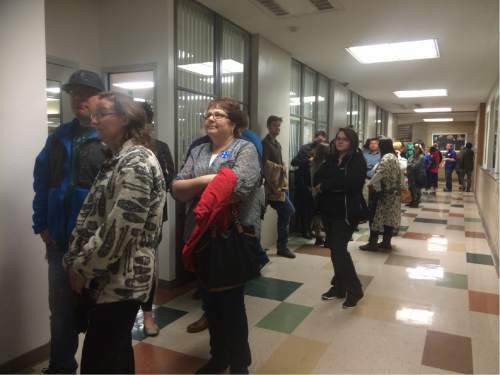 Leah Hogsten | The Salt Lake Tribune Lines and wait times were long at the Democratic caucus at Clayton Middle School as both registered party members and unaffiliated voters cast their ballots, Tuesday, March 22, 2016. Leah Hogsten | The Salt Lake Tribune Lines and wait times were long at the Democratic caucus at Clayton Middle School as both registered party members and unaffiliated voters cast their ballots, Tuesday, March 22, 2016. 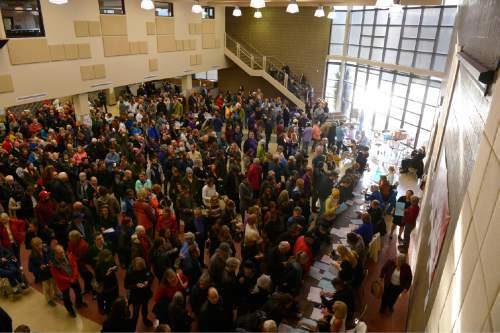 Leah Hogsten | The Salt Lake Tribune Lines and wait times were long at the Democratic caucus at Clayton Middle School as both registered party members and unaffiliated voters cast their ballots, Tuesday, March 22, 2016. 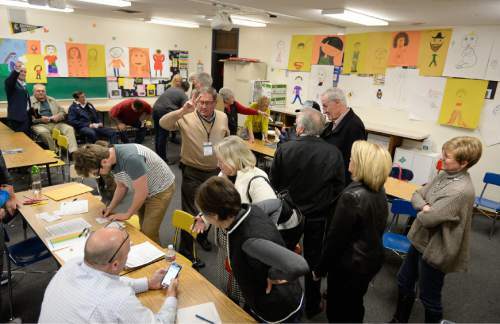 Leah Hogsten | The Salt Lake Tribune Lines and wait times were long at the Democratic caucus at Clayton Middle School as both registered party members and unaffiliated voters cast their ballots, Tuesday, March 22, 2016. 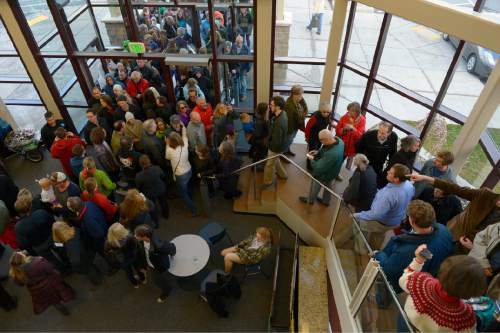 Leah Hogsten | The Salt Lake Tribune Lines and wait times were long at the Democratic caucus at Clayton Middle School as both registered party members and unaffiliated voters cast their ballots, Tuesday, March 22, 2016. 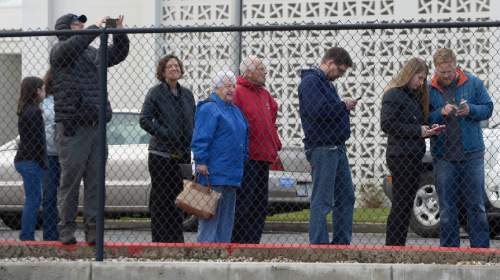 Leah Hogsten | The Salt Lake Tribune Lines and wait times were long at the Democratic caucus at Clayton Middle School as both registered party members and unaffiliated voters cast their ballots, Tuesday, March 22, 2016. 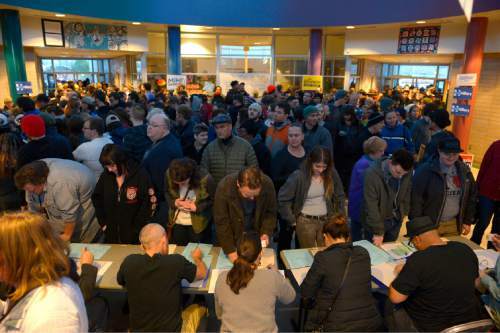 Leah Hogsten | The Salt Lake Tribune Lines and wait times were long at the Democratic caucus at Clayton Middle School as both registered party members and unaffiliated voters cast their ballots, Tuesday, March 22, 2016. 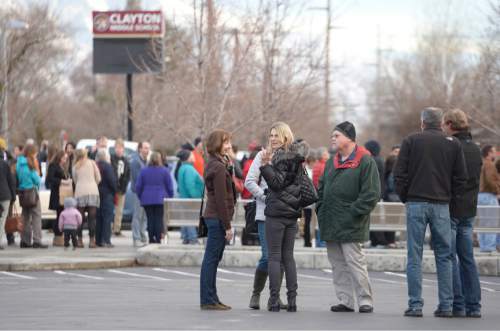 Leah Hogsten | The Salt Lake Tribune Lines and wait times were long at the Democratic caucus at Clayton Middle School as both registered party members and unaffiliated voters cast their ballots, Tuesday, March 22, 2016. 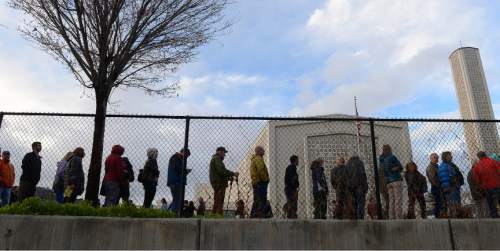 Leah Hogsten | The Salt Lake Tribune Lines and wait times were long at the Democratic caucus at Clayton Middle School as both registered party members and unaffiliated voters cast their ballots, Tuesday, March 22, 2016. Wendy Ogata | Courtesy Lines of Democratic caucus voters snake through the halls of Roy High School on Tuesday, March 22, 2016. Wendy Ogata | Courtesy Lines of Democratic caucus voters snake through the halls of Roy High School on Tuesday, March 22, 2016. People assemble at a Republican caucus site Tuesday, March 22, 2016, in Salt Lake City. 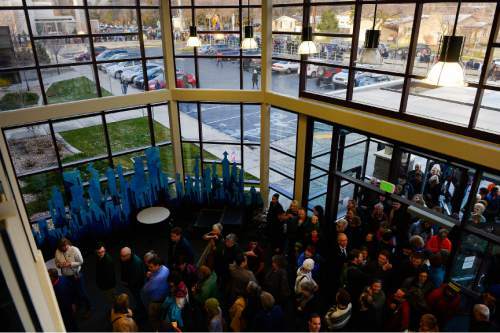 (AP Photo/John Locher) People wait in a line to vote at a Democratic caucus site Tuesday, March 22, 2016, in Salt Lake City. 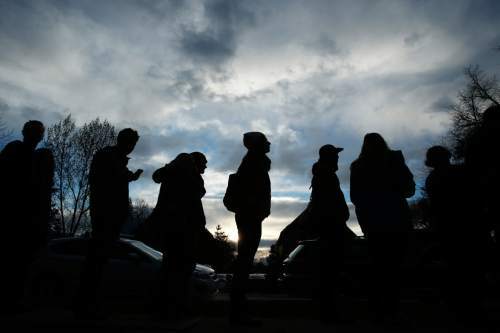 (AP Photo/John Locher) Leah Hogsten | The Salt Lake Tribune Lines and wait times were long at the Democratic caucus at Mountain View Elementary School as both registered party members and unaffiliated voters cast their ballots, Tuesday, March 22, 2016. Francisco Kjolseth | The Salt Lake Tribune Republicans gather at Cottonwood High School for the GOP caucus on Tuesday night, March 22, 2016. 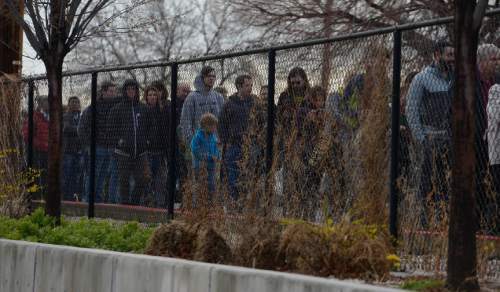 Utah voters waited in lines that stretched multiple city blocks for a chance to cast a ballot in the presidential caucus, an unprecedented turnout in a state that is rarely in the political spotlight. The paper ballots will be counted by hand at each caucus meeting, making it likely that the final results won&apos;t be known until the early hours of Wednesday. At some Democratic caucus locations, party volunteers ran out of ballots and were waiting for the party to deliver more. At Clayton Middle School on the east side of Salt Lake City, Debra Walker, a business analyst, had just filled out her ballot in support of Democrat Bernie Sanders and looked over the people standing in 15 lines. Being a Democrat in such a conservative state, she&apos;d often felt like voting was a perfunctory chore, but not today. "This is the first time it matters that I come out to vote in Utah," Walker said. "It feels good. It is a voice." She had never heard of Sanders, the senator from Vermont, before this race, but felt that he would bring progressive programs that may be common in Europe to the United States. In her district, roughly 800 people caucused two years ago, but this time there were thousands. Salt Lake City Mayor Jackie Biskupski said the turnout was "incredible." "Seeing the excitement at the opportunity to be engaged, that matters, because our elected officials matter," said the mayor, who is supporting Democrat Hillary Clinton. Biskupski said Clinton is the most experienced candidate in the field, the most likely to work across the aisle with the Republicans and has concrete funding proposals for her plans. At Cottonwood High School in Murray, Josh Romney was casting an absentee ballot for his father, Mitt Romney, who was in Washington, D.C.
"I&apos;m voting the same way my dad is. Our politics line up pretty well," Josh Romney said, sitting in an art room jammed with 51 other people from his Holladay precinct. Why does he like Cruz? "Right now it&apos;s important to stop Donald Trump, and Ted Cruz is in the best position to do that," he said. He added, "I share his conservative values. His vision for America is strong and positive." GOP gubernatorial Jonathan Johnson, who lives in a neighboring Holladay precinct is a strong supporter of Cruz. "He will be a constitutional conservative," Johnson said. 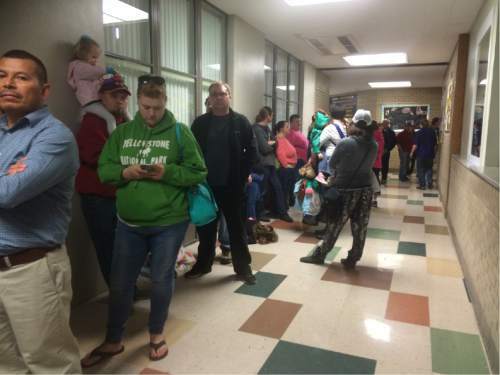 At Emerson Elementary in Salt Lake City, the line to vote in the Democratic caucus was still longer than a block at 9 p.m.
State Rep. Joel Briscoe said party volunteers had gone through 5,0000 ballots at the school, then began photocopying more after they ran out. Bernie Sanders supporter Gerald McDonough, 70, said he had never seen anything like it. "Trump has a lot to do with it, he&apos;s got everybody riled up." The Democrats opened their caucuses a half hour early to accommodate the crowds. Everyone in line by 8:30 p.m. will be able to cast a ballot. Marv Hamilton, 67, showed up early and got through the line in about an hour at Emerson. On the way out, he cheered on the people waiting in long lines. "I&apos;m lying to them that they&apos;re almost there," he said. Hamilton credited Sanders, calling his campaign a "revolution," adding, "He&apos;s the closest thing to anything real that we&apos;ve had in a long time." 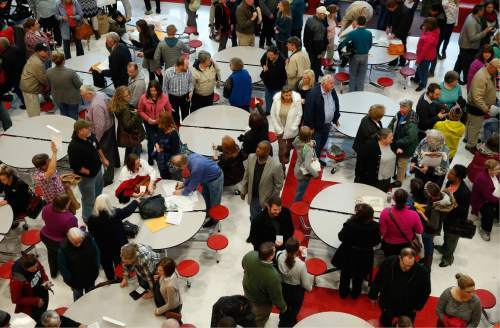 Republican caucuses were often just as busy, overwhelming school gyms throughout the state. On the GOP side, at least 30,000 voters elected to cast their ballots online, which acted as a safety valve. For those who pre-registered, online GOP voting is available until 11 p.m. Check back throughout the night for updates.  Lee Davidson and Jennifer Dobner contributed to this report.